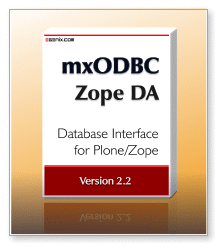 eGenix is pleased to announce mxODBC Zope DA™ version 2.2.3, our popular Plone/Zope ODBC Database Adapter, compatible with Plone 4.0 - 4.3 and Plone 5.0, Zope 2.12 and 2.13 and Python 2.6 and 2.7 - available on all major platforms. The mxODBC Zope Database Adapter is highly portable, just like Zope itself, and provides a high performance interface to all your ODBC data sources, using a single well-supported interface on Windows, Linux, Mac OS X, FreeBSD and other platforms. For major and minor upgrade purchases, we will give out 20% discount coupons going from mxODBC Zope DA 1.x to 2.2 and 50% coupons for upgrades from mxODBC Zope DA 2.x to 2.2. After upgrade, use of the original license from which you upgraded is no longer permitted. Patch level upgrades (e.g. 2.2.0 to 2.2.3) are always free of charge.